Macbeth is authentically set in eleventh century Scotland. This epic, award winning production conjures a world of grim battlefields, desolate moors, forbidding castles and haunted caverns. Peopled by witches and warriors, assassins, Kings and an infamous Queen, Macbeth moves at a breathtaking pace through tales of war, murder, intrigue and revenge. 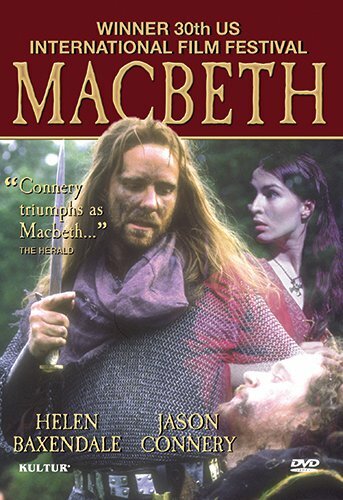 New York, NY (April 30, 2013) - Kultur is proud to announce the DVD release of Shakespeare's Macbeth, the feature film starring Jason Connery available May 28, 2013. "Gripping, intense and terrifying, Jason Connery brings back the power, menace and majesty to Shakespeare's tragic hero. Helen Baxendale gives the greatest performance of Lady Macbeth yet seen in the cinema..."
The first major film production for quarter of a century, Macbeth is authentically set in eleventh century Scotland. This epic, award winning production conjures a world of grim battlefields, desolate moors, forbidding castles and haunted caverns. Peopled by witches and warriors, assassins, Kings and an infamous Queen, Macbeth moves at a breathtaking pace through tales of war, murder, intrigue and revenge. Also features 'The Making of Macbeth' a 30 minute documentary and includes interviews with Jason Connery and Helen Baxendale.